Europe and European Union greatly exercised Churchill’s thought. While circumstances today are far different, his formulations remain instructive of his role as a grand strategist. On 19 September 1946, speaking at the University of Zurich, Switzerland, Winston Churchill proposed the creation of “a kind of United States of Europe”—”a European group which could give a sense of enlarged patriotism and common citizenship to the distracted peoples of this mighty continent.”1 With this proposal, and his activities over the next several years, Churchill put his enormous personal prestige behind the cause of European unity. His campaign was by no means without controversy, especially at home. He was no longer Prime Minister. The ruling Labour government by and large did not favor his approach. Neither (for different reasons) did certain elements of Churchill’s own Conservative Party, which he served as leader. Further, over the coming years, it became evident that he did not favor full British membership in a future European political union, although he said he anticipated a close association. Britain was to be with, or of, but not in, Europe. Churchill’s ideas about European unity, and Britain’s relationship to Europe, have increasingly come to light during the recent economic and political turmoil in the European Union. British Prime Minister David Cameron’s attempt to renegotiate the terms of British membership will lead to a national referendum on June 23rd, which could result in Britain’s departure (“Brexit”) from the Union. Both the Euro-skeptics and the Euro-enthusiasts have invoked Churchill’s name on behalf of their cause. We should not project Churchill’s arguments directly into the Brexit debate, since they were made in a much different context.4 There has since been much water under the bridge. It is fair to say that the European project (as we might call it) has followed a trajectory different from that originally envisioned by Churchill. He would undoubtedly be pleased with much of what has been accomplished in the name of European unity, but displeased in many ways with what the Union has become and done. Of course, Churchill was always one to work with the material at hand. No Wilsonian, he had seized upon the League of Nations during the mid-1930s as a principle vehicle with which to try to rally resistance to Nazi Germany. In the dark days of May-June 1940, he had proposed a political union of France and Britain. In working through Churchill’s views on the European project, we can learn something of Churchill as a practicing grand strategist, and perhaps indirectly shed light on the current circumstances. It is important to recall the circumstances immediately after World War II. The continent, both winners and losers, was devastated and demoralized. 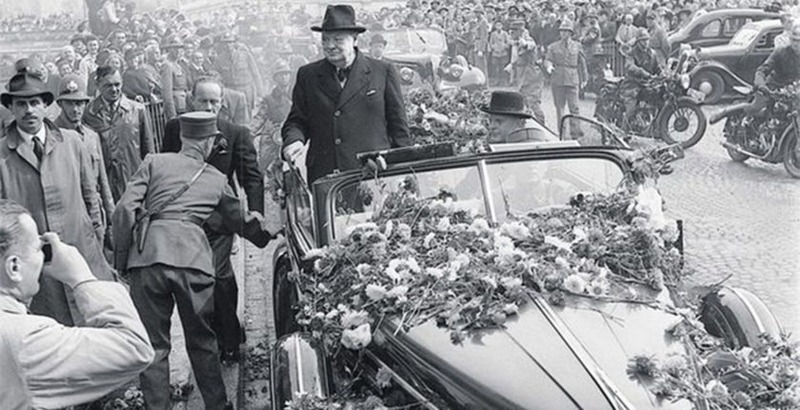 As Churchill reminded his Zurich audience, “over wide areas are a vast, quivering mass of tormented, hungry, careworn and bewildered human beings, who wait in the ruins of their cities and homes and scan the dark horizons for the approach of some new form of tyranny or terror.” European civilization, in his view, was on the verge of collapse. In another famous 1946 speech, at Fulton Missouri in March, he had warned that an Iron Curtain was descending upon Europe. On the Western side of the curtain, communist parties, most of them under the direction of Moscow, seemed poised to take advantage of the terror to impose their form of tyranny. Although Churchill did not believe the Russians wanted war, only the fruits of war, he admitted that one could not be sure.5 Two hundred or more Russian divisions (as Western intelligence then estimated) were on the other side of the line. Britain itself was weakened by the war and could no longer alone play its historic role of continental balancer. The one great power not affected directly by the war, the United States, had demobilized most of its armed forces and its future role in the world remained uncertain. America did have the atomic bomb, and this perhaps provided a breathing space to create the means that would save civilization. But there was not an infinite amount of time, as that monopoly was bound to be broken soon. How to deal with this critical situation? In speeches throughout the late 1940s, Churchill envisioned three interrelated pillars, or “majestic circles,” around which the security of free peoples could be organized. Britain would play a critical, although distinct, role in each (and was the only member of all three). First, there was the British Commonwealth and Empire, the traditional hub of Britain’s economy, and focus of its larger civilization purpose in the world. It would serve as a bulwark against, and alternative to, the radicalism already sweeping what would come to be called the Third World, and provide strategic locations of great value. Second, there would be a close association of the English-speaking peoples, of which an Anglo-American alliance would be the core. Through this, America’s power and vitality could be brought fully to bear on the problems facing the world, including those in Europe (in association with Britain). This had been another major theme of the Fulton Address. Finally, and that which concerns us here, was the creation of a united Europe.6 Churchill’s European project should not be viewed in isolation, but in the context of his larger strategic concept. To achieve this reconciliation, Churchill later explained, France must reach out to Germany: it was only by an “act of faith” on the part of France that this could be done, and it was “by this act of faith alone that France will regain her historic position in the leadership of Europe.”8 But faith alone was not enough; deeds were required. The French would act only if Britain added its political, economic and military weight to the equation, to reassure France that it had a margin of safety over a future German state. At the same time, Britain could take the high road in reconciling Germany to the rest of the Western Europe. Otherwise, the German peoples, now crushed and divided among the occupying powers, might revive only to resume their bad habits, or look east for their succor. The Franco-German partnership, buttressed by Britain in the context of a united Europe, was also essential to maintain a balance of power on the continent as a whole. Churchill made no bones about the positive effect that a closer association of European nations—including the addition of German power, at least its western sectors—would have on Russian strategic calculations; but in the Zurich speech and private correspondence he was careful not to present the European project as strictly anti-Soviet in purpose.9 Some early advocates of European unity were from the far right, but Churchill wanted the project to be inclusive, to include parties of the moderate and socialist left, who would be suspicious that an anti-communist crusade was aimed at them. Although the United States figured only tangentially in the Zurich speech (primarily as possessor of the atomic bomb), the Americans were constantly on Churchill’s mind. Washington was clearly cautious about being stuck with the entire bill for Europe’s recovery and its defense, especially if the Europeans squabbled among themselves and failed to cooperate and utilize their own resources wisely. Given these high purposes, why was Churchill reticent on the point of British membership in a European political union? It has been argued that he was manifesting that side of the British strategic tradition which sought to maintain distance from the affairs of the continent in order to focus on maritime and imperial concerns. Churchill’s political career, however, showed a willingness to follow the alternative tradition, that of his ancestor, the Duke of Marlborough, of active and continuous engagement with affairs on the continent to maintain a balance of power—certainly when that balance was threatened by a would-be hegemon. Remember that the separation of Britain from the Continent was the specific reason she could have an outsize influence. But for the Channel, Britain was another middling power, like Spain. Move Britain out into the middle of the Pacific, conversely, and she would have little import. It was the combination of proximity and separation that made the opportunity for Britain to be great. Grand strategy, in any case, often involves political compromise, and Churchill had to take into account those in Britain, including members of his own party, who favored the former tradition. Churchill himself undoubtedly felt that there were sufficient distinctions between British and continental histories and cultures as to make some degree of separation beneficial to all parties, his own nation above all. The opposite danger was that a united Europe might go too far and become a Gaullist-like Third Force in world politics, steering between East and West, but objectively anti-American. The United States must be assured this would not be the case. Britain would best serve as a bridge and honest broker between the United States and Europe, something that would be difficult to accomplish if Britain tried to be America’s closest ally while also being bound by political decisions reached in Europe. If forced to choose, Churchill declared many times, Britain would choose America; the key was not being forced to choose. And if the European project succeeded, Britain would indeed be in a better position to turn her back on the continent, at least in relative terms, and thus maintain her position as an independent world power. We should also not underestimate the importance the Churchill placed on the British Commonwealth, and the complications full British membership in Europe might create for that relationship, especially in economic matters. At the very least, negotiations about British participation in European-wide organizations would raise suspicions about Britain’s intent. What would a united Europe look like? Churchill, it is critical to remember, spoke of “a kind of a United States of Europe,” not necessarily a precise replication of the American constitutional order in a unitary state. He often portrayed it as a regional association, comparing it with the British Commonwealth and the security arrangements in the Western Hemisphere.16 The first step was the creation of a Council (or Congress) of Europe; the rest, he thought, would evolve with experience over time. This brings us full circle to the present—a very different time to be sure. There are the well-known political and economic challenges facing the European Union as a whole, as well as the particular complaints raised by many in Britain (and throughout Europe) about the unaccountable and undemocratic character of the Union. Bureaucratic fiats from Brussels, they say, have replaced laws created by the consent of the governed. To take a broader perspective, sometimes the more things change, the more they remain the same. They would certainly be recognizable to Churchill. Europe seems trapped in a long-term civilizational malaise, verging on crisis. German power and ambitions, although of a different character from of the past, are still often perceived as excessive by Germany’s neighbors, even within the supposedly protective cocoon of the European Union. Ways must be found to reassure the rest of Europe while anchoring Berlin to the West and discouraging it from turning east. Concern also extends beyond Germany. Various ultra-nationalist European political parties look to make common cause with each other; some find the civilizational values espoused by Putin’s Russia (aided by Putin’s money) to be more congenial than those of Churchill’s classic European virtues, or the postmodern perspective of Brussels. For those who still take strategic matters seriously, Russia again represents a military threat that must be balanced, this time with the need to defend a European project that has now been extended from the Atlantic to the Black Sea (wisely or not)—a project whose existence is also threatened by events in the Middle East that are exacerbated if not orchestrated by Moscow. Unfortunately, Europe, as a matter of choice, currently lacks the indigenous forces to provide such a balance. The United States should be a critical element in this calculus, but it has almost completely withdrawn combat forces from Europe and announced a pivot (rebalancing) to the Pacific, after being reassured by the Europeans that their continent had become a zone of peace. For those in Britain and throughout Europe now contemplating the best course for themselves and the European Union, we must hope they will take a broad, long-term, Churchillian perspective on how to address these great challenges. Patrick J. Garrity is a Research Faculty Associate with the Miller Center of Public Affairs, University of Virginia. 1 Winston S. Churchill, “The Tragedy of Europe,” Zurich, 19 September 1946, in Robert Rhodes James, ed., Winston S. Churchill: His Complete Speeches, 8 vols. (New York: Bowker, 1974), hereinafter CS, VII 7380. During the 1930s and World War II, Churchill had speculated favorably about the possibility of European unity. He had raised the matter of a United States of Europe in speeches in Brussels on 16 November 1945 and in the Netherlands on 9 May 1946, but the Zurich speech focused international attention on his proposal. In this essay, I focus on Churchill’s arguments in favor of European unity from 1946-1950, because he gave the greatest attention to them during this period. 2 Churchill, “The Schuman Plan,” House of Commons, 27 June 1950, CS, VIII 8024. 4 On this point, see Langworth, Churchill and the Avoidable War: Could World War II Have Been Prevented? (Moultonborough, N.H.: Dragonwyck Publishing, 2015), 8-9. 5 Churchill, “The Sinews of Peace,” Westminster College, Fulton, Missouri, 5 March 1946, CS, VII 7285-93; House of Commons, 23 October 1945, CS, VII 7397. 6 Churchill, “Perils Abroad and at Home,” Conservative Conference, Lladuadno, Wales, 9 October 1948, in CS, VII 7712. In such presentations, Churchill placed the Empire and Commonwealth first in order. I have elaborated on the value of the three circles in a way I believe consistent with Churchill’s thinking. 7 Zurich Speech, CS, VII 7379-82. 8 Churchill, “United Europe,” Albert Hall, London, 14 May 1947, CS, VII 7486. 9 Churchill to Viscount Cecil of Chelwood, 9 June 1946; Churchill to Duncan Sandys, 29 June 1946, Churchill Papers, 2/23; cited in Martin Gilbert, Winston S. Churchill ,vol. 8, Never Despair 1945-1965 (Hillsdale, Mich.: Hillsdale College Press, 2013), 243. 10 Churchill, House of Commons, 27 June 1950, CS, VIII 8023. 11 Winston S. Churchill, “United States of Europe: Statement of Aims,” undated: Churchill Papers, 2/19, cited in Gilbert, Never Despair, 278-79. “It is better to have a world united than a world divided; but it is also better to have a world divided, than a world destroyed. Nor does it follow that even in a world divided there should not be equilibrium from which a further advance to unity might be attempted as the years pass by. Anything is better than this ceaseless degeneration of the heart of Europe. Europe will die of that.” Churchill, House of Commons, 5 June 1946, CS, VII 7353-54. 12 “The whole purpose of a united democratic Europe is to give decisive guarantees against aggression….The creation of a healthy and contented Europe is the first and truest interest of the Soviet Union. We had therefore hoped that all sincere efforts to promote European agreement and stability would receive, as they deserve, the sympathy and support of Russia. Instead, alas, all this beneficent design has been denounced and viewed with suspicion by the propaganda of the Soviet Press and radio.” Churchill, “United Europe, Albert Hall, London, 14 May 1947, CS, VII 7487. 13 Churchill to Leon Blum, 7 April 1948, Churchill Papers, 2/18, cited in Gilbert, Never Despair, 400. 14 “The United States of Europe would be neither dependent on nor opposed to the United States of America or the Soviet Union.” Churchill, “United States of Europe: Statement of Aims,” 278-79. 15 Churchill, “The European Movement,” Kingsway Hall, London, 28 November 1949, CS, VII 7900. 16 Churchill, House of Commons, 27 June 1950, CS, VIII 8025. 17 Churchill, “The Congress of Europe,” The Hague, 7 May 1948, CS, VII 7636. Churchill also spoke in favor of the establishment of a European Court of Human Rights: “We have the Charter of Human Rights and we must have a European means of defending and enforcing it. It must not be possible that, within the boundaries of United Europe, such a legal atrocity could be perpetuated as that which has confronted us on the in case of Cardinal Mindszenty.” There must be means “by which such events in any of the countries with which we can consort can be brought to the test of impartial justice.” Churchill, “European Unity,” Brussels, 26 February 1949, CS, VII, 7794. 18 Churchill “United States of Europe: Statement of Aims,” in Never Despair, 278-79. 19 “It is said with truth that this involves some sacrifice of national sovereignty. But it is also possible and not less agreeable to regard it as the gradual assumption by all nations concerned of the larger sovereignty which can also protect their diverse and distinctive customs and characteristics and their national traditions all of which under totalitarian systems, whether Nazi, Fascist, of Communist, would certainly be blotted out together.” Churchill, “The Congress of Europe, The Hague, 7 May 1948, CS, VII 7636.